During the last three days in Panama I had an infection that got worse by the day. 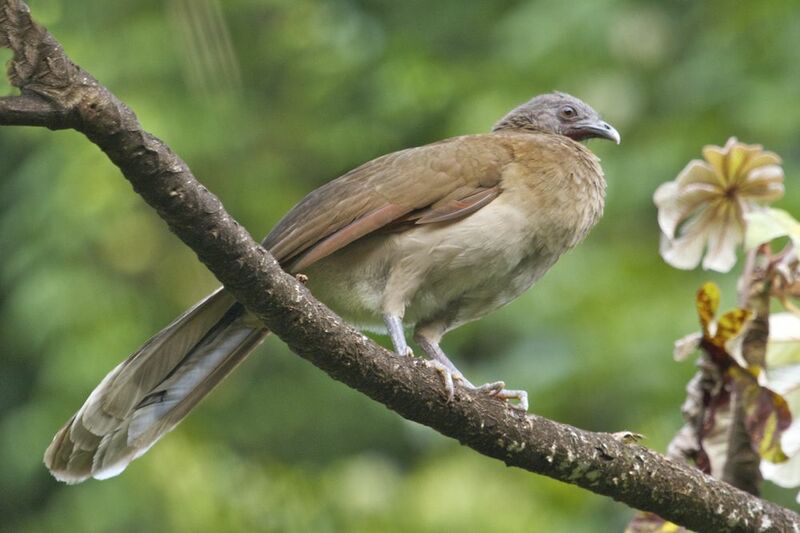 By the morning of March 15 I was feeling so weak that I turned back from birding down Old Gamboa Road. Bob, Floyd, and I rested on the trail between the two Summit Ponds while the others continued. That was my only regret of my trip to Panama. 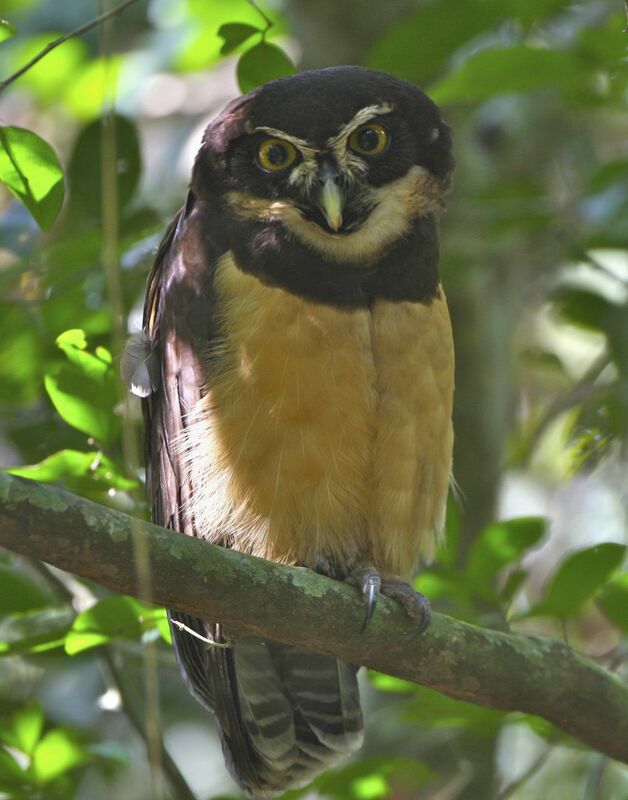 Carlos took the rest of the group along a side trail to see a Spectacled Owl. But Larry captured a wonderful shot of this uncommon and colorful owl and shared it with me. In general he shares his photos on Discover Life, where currently 34 pages of his photos start here. That day my left eye kept tearing so much that I couldn’t see clearly with it no matter how often I wiped it. But worse was the pain in my right ear. It got so strong that I had to take two Vicodins at a time to control it. Then, that night at about 3 a.m. the pain stopped suddenly. But it stopped only because something in my ear broke and blood came pouring out. It was still bleeding when I got up at 5:30 a.m. for breakfast. Eric then gave me something to help control the infection, but I wasn’t up to participating in the morning expedition to the Panama Rainforest Discovery Center. The only outings that I skipped entirely were that one and the afternoon outing the day before to the area around the town of Gamboa. As I write this a week later I am well again. Before I left Panama I emailed my doctor, and he had a prescription ready for me to pick up when I returned home on March 18. Sloths and monkeys were the mammals near Canopy Tower that I was most successful in photographing. 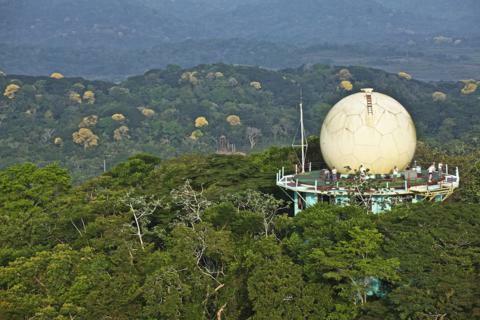 One day we walked down the mile-long road from Canopy Tower on Semaphore Hill to the Panama City-Gamboa highway. 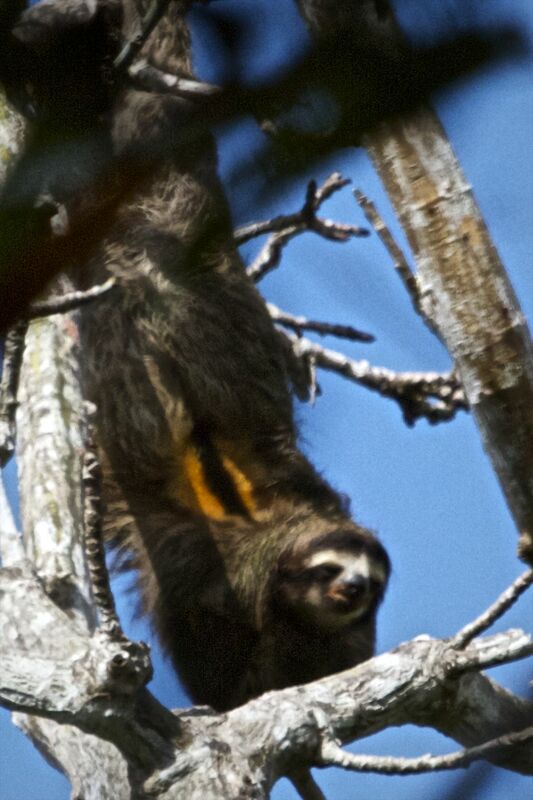 Our guide, Carlos Bethancourt, spotted a Brown-throated Three-toed Sloth hanging upside down in the tree canopy, and we got great views of it as the sloth became as active as sloths get. In other words it scratched its back. On another day as we walked along the famed Pipeline Road we took a short side trail into the forest to a monkey roost. A couple of hours later we were walking along Pipeline Road, which we build to accompany an oil pipeline running across Panama during World War II. While we never had to use the pipeline, the road remains and has a reputation for being one of the best birding spots in the world. 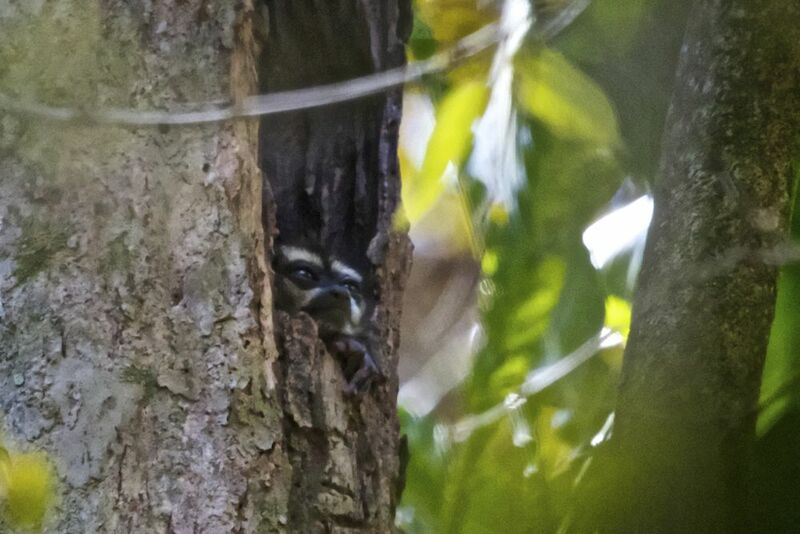 Not only did we see birds here, but this is where we spotted a monkey hanging by his prehensile tail. While I know what a prehensile tail is, I’m still trying to figure out what a hensile tail would be. 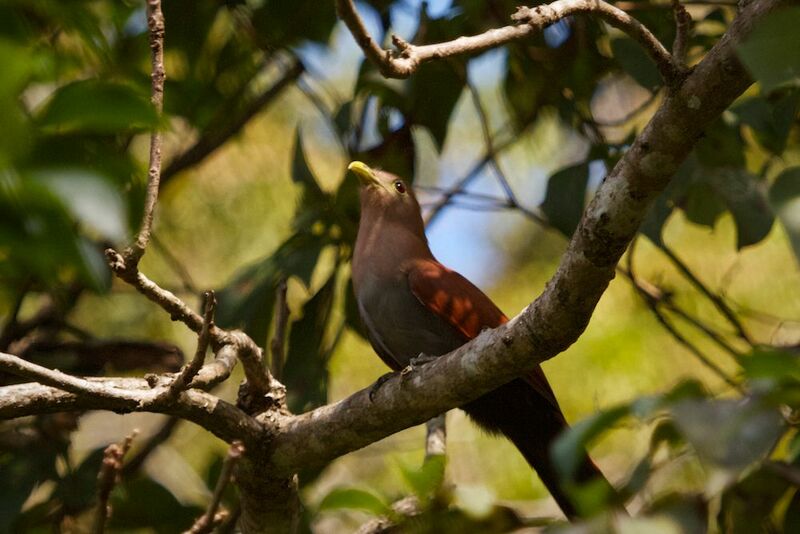 During our stay at Canopy Tower, we drove and walked all over Soberanía National Park looking for birds. 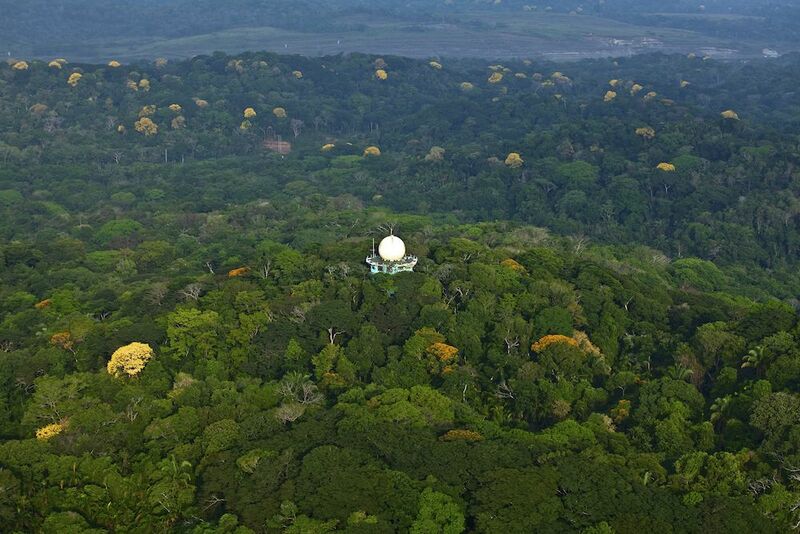 But the forest canopy around the tower was especially rewarding, especially at the beginning and end of each day. At sunrise one morning I was at the tower when this cacique flew in. Then, the bird that I most wanted to see in Panama flew close to the tower. 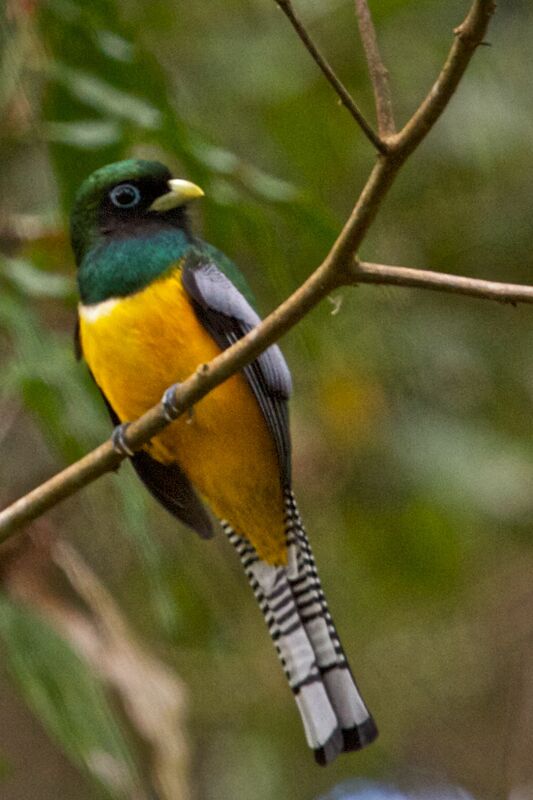 This gaudy bird has a big bill because it eats fruit. Right away, another beautiful bird came by. Just renamed the Gartered Trogon from Violaceous Trogon, this is another of Panama’s most colorful birds. 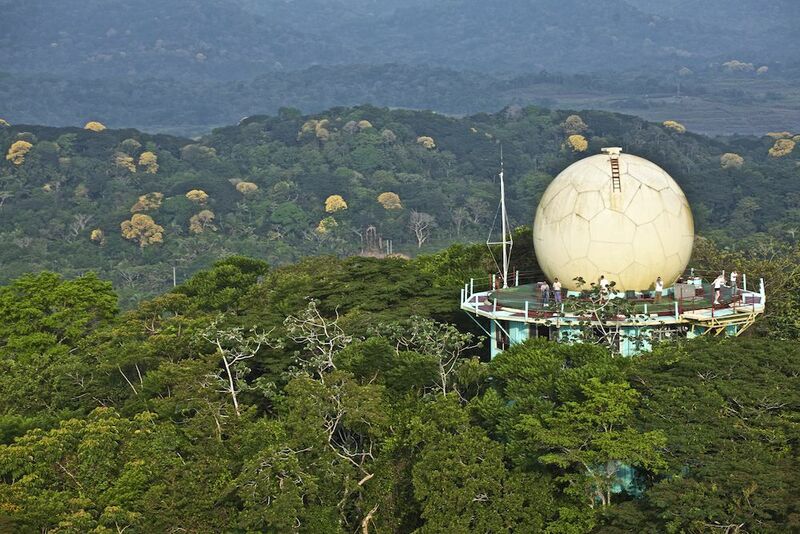 Canopy Tower, where I stayed for the week of March 10-16, was a secret U.S. Air Force radar station from 1965 to 1995. 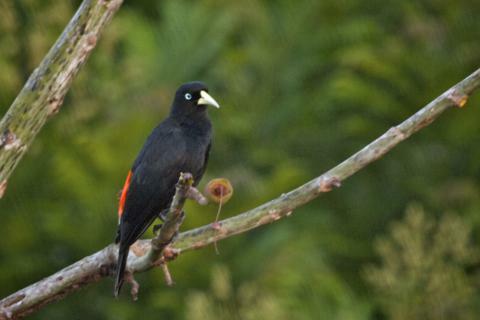 Then, Raúl Arias de Para converted it into an birding lodge that opened in 2000. The lodge is 900 feet above sea level on Semaphore Hill near the Continental Divide. The site is in the rainforest within Soberanía National Park, which was part of the former U.S. Panama Canal Zone. By staying both at Canopy Tower and earlier at Canopy Lodge I was able to see quite different birds in those habitats. The tower is at the treetops in the lowlands, while the lodge is at ground level in the highlands. The top floor of the tower has an unobstructed 360° view. It is a great place to see birds and mammals as well as the Pacific entrance to the Panama Canal and the Culebra Cut, the narrowest part of the canal. The octagonal tower is on five levels. On the ground floor is the office, gift shop, and displays. The second floor has five single rooms, one of which I inhabited for a week, and one double room. The third floor has seven double rooms. The fourth four houses the living room, dining room, kitchen, and library. Then, up a steep, narrow staircase is the observation deck, which is 74 steps above ground level. Two more couples, Lynne and Jerry from St. Louis, and Donna and Floyd from Seattle, joined us at the tower. That brought our group total to nine plus Eric, our tour leader. We were lucky to find a Pearl Kite as we drove from Panama City to Canopy Lodge along the Pan-American Highway. This is, by the way, the world’s longest motorable road, according to Guinness World Records. 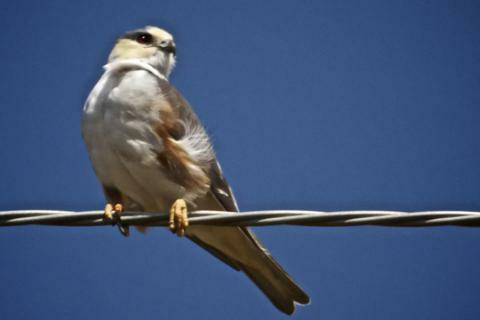 The Pearl Kite, a raptor that is even smaller than the American Kestrel that I have often photographed at home, breeds in Panama but isn’t common anywhere in the country. It is the smallest raptor in the Americas. Early on our first morning at Canopy Lodge I was walking from my room to the lodge’s main building when I encountered Eric. He led me up to the top of the three-story observation tower at almost eye level so I could get a nearly eye-level shot of the first big bird we saw there. The sound of this bird’s name added to my enthusiasm for it. 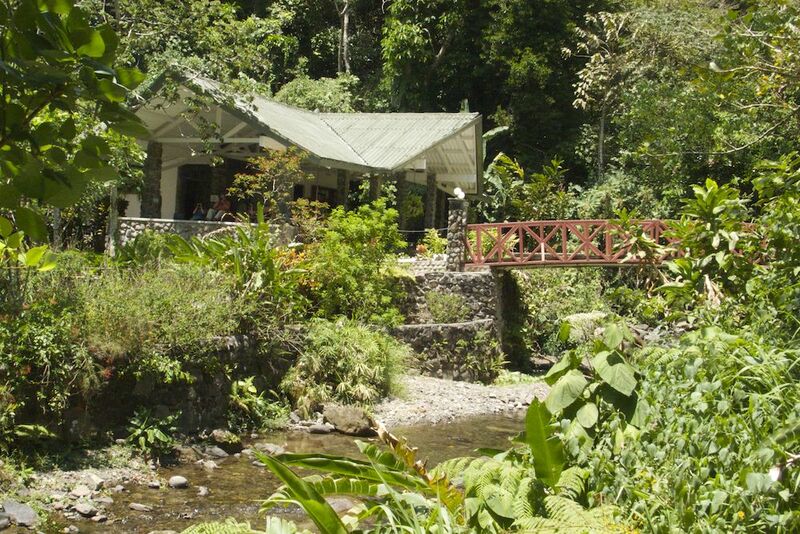 Canopy Lodge, where I stayed on the nights of March 6 through 9, opened in 2005 along a clear running stream. The lodge consists of four buildings: the main building is the kitchen, and the completely open dining room, the library, and the living room. The other buildings have a total of 12 guest rooms, each with a private bath. Raúl Arias de Para created Canopy Lodge. The grandson of Don Tomás Arias, one of the founders of the Republic of Panama, Raúl graduated from St. Joseph’s College in Philadelphia, and from the University of Virginia, where he obtained an MS degree in 1970. Returning to Panama, he became a banker, then a member of the National Assembly, then after the fall of Noriega became the country’s Financial Director of Public Security, then a businessman. 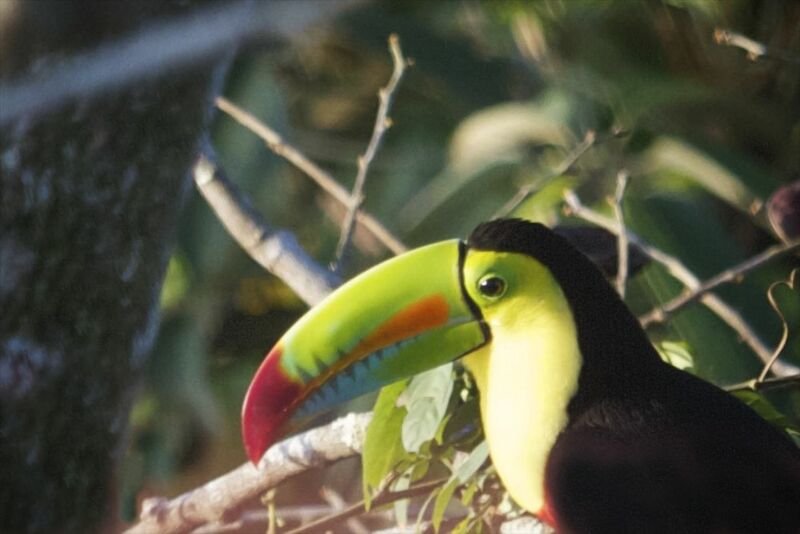 He is now perhaps the country’s leader in fostering its ecotourism. Visiting Canopy Lodge during the dry season was comfortable in every way. None of the guest rooms even had locks. But because the lodge is within a gated compound, I felt completely safe leaving my camera, my MacBook Air laptop, and iPad in the unlocked room or even in the open living and dining areas of the lodge. I was amazed at the absence of mosquitos and other bugs. And the lodge, at 2,000 feet according to Google Maps, was well above the sweltering heat and humidity of Panama’s lowlands. The lodge sits next to the protected area of the Cerro Gaital Natural Monument within El Valle de Antón, a 20-mile wide crater. We had fast and easy Internet access, but no phones, no TV or radio, which I think is the ideal scenario. The computer for guest use is a 27-inch iMac, just like my main computer at home. Raul told me that originally he had used a PC, but guests often downloaded viruses to it, so he switched to a Mac. Our leaders at Canopy Lodge were naturalist Eric Horvath and bird guide Harmodio “Moyo” Rodríguez. Both were incredibly knowledgeable, positive, and helpful. My trip to Panama started this morning with a four-hour hike through Metropolitan Natural Park in Panama City. It is the only park in Central America within a big city. It covers about 573 acres, and we seem to have explored all of it.